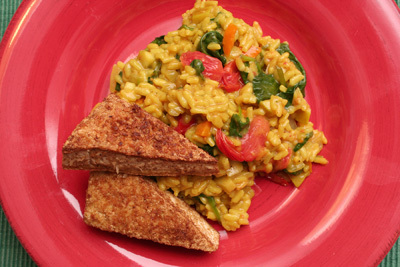 I was dazzled by many elements of the recipe for “Mulligatawny Risotto with Coconut-Crusted Tofu,” from the April 2009 issue of Cuisine at Home (recipe below). Risotto is always a luxurious treat, and this one features both coconut milk and white wine. Many spices are employed, and spinach, tomatoes, and apple are tossed in. After all the risotto fun, is the added bonus of tofu coated with a spiced coconut mixture. After it is sauteed, it boasts a great crusty texture on the outside and a moist inside, fabulously flavored. Using lite coconut milk instead of the full-fat variety ensures it won’t curdle. Combine broth and coconut milk in a saucepan over low heat, and keep mixture warm. Sauté bell pepper, onion, garlic, gingerroot, and jalapeño in 3 Tbsp. olive oil over medium heat until soft, 3-4 minutes. Add curry powder, pepper flakes, and rice; stir and cook until vegetables and rice are coated with oil, 1-2 minutes. Add wine; simmer, stirring constantly, until liquid evaporates, about 2 minutes. Stir in 1/2 cup broth mixture; simmer until it’s completely absorbed. Continue adding broth mixture in 1/2-cup increments, stirring frequently and adding more broth only after previous addition is absorbed. Taste after 15 minutes of cooking; continue cooking until rice is firm but not chalky or chewy in center of grain; remove from heat. Stir in spinach, tomatoes, apple, and butter; season with salt. Combine coconut, cumin, coriander, ground ginger, and cloves for tofu in a small bowl. Dredge tofu slices in coconut-spice mixture until coated. Sauté tofu in 2 Tbsp. oil in a large nonstick skillet over medium-high heat until lightly browned, 3-5 minutes per side. The recipe seems lengthy, but it’s far from unmanageable. First, I pressed my block of tofu for 3 hours 15 minutes. I placed the tofu block between two plates, the top weighted with a big can of tomatoes, in the refrigerator. This process presses out the extra moisture that would interfere with the sauteed texture of the tofu. It’s not a troublesome technique. Instead of using jalapeño pepper in the initial sauté, I used extra bell pepper. This is the first time I used coconut milk in a risotto, and it was fantastic. I used “light” Native Forest organic coconut milk and my wine was a 2007 Argentinian Torrontes. When I added the wine to the pot, it was absorbed in a quick 30 seconds. My risotto needed 20 minutes of cooking (and stirring). I used all of the broth/coconut milk mixture, plus an additional half cup of liquid. I seasoned my risotto with 1 1/2 tsp. salt. Next: sauteeing the tofu. I was so excited to coat the tofu with coconut -- I never fathomed such a thing. Combined with an intriguing mix of spices -- ground cumin, coriander, ginger, cloves -- the coconut clung to the tofu, as I sauteed it for 5 minutes per side. This may have been my proudest tofu moment: crusty outside, moist inside. The final smooth and tasty risotto was too spicy for my young child. Curry and ginger flavors were bold. The tomatoes, spinach, and apples were interesting touches. Overall, this was a great meal. We all enjoyed that tofu! So next time, I’ll return to chicken land. I’ll make “Baked Chicken Nuggets” and “Minted Lemon Asparagus,” both from Allrecipes.com. See what happens to this meal, when you return to my site on Thursday, September 24.